I don’t think I’m alone in saying I love reminiscing about the past, especially in gaming. I love looking at cover art from the past, essentially hand-drawn covers that have nothing to do with the game in some cases (I’m looking at you Mega Man). It’s also great seeing mash-ups of new games in old packaging, like this Death Stranding one. Posted by Reddit user thereadyset1991, we see a depiction of Death Stranding in the iconic jewel cases PS1 games were housed in that will surely fuel your nostalgia for Playstation’s inaugural console. The first case shows what would be the front cover, with the title over Norman Reedus’ character from the game. It also has a Pegi 16 rating as well as the PlayStation logo on just about every corner of the case. Lastly, we see the Kojima Productions logo on the right corner. The second case depicts the back side of the case with the Death Stranding logo over Mads Mikkelson’s character from the game. It also has a tagline “death is never the end” with the word “never” in red. Unlike the more prominent case in the picture, this one looks like a multi-disc case, similar to the one that Final Fantasy VII was housed in. Surely, this game would be 14 discs with how people have been reacting after seeing it for the first time. Yes, disc amount equates to the overall quality of the game, obviously. If the year was 1997 and I saw this cover, I’d probably check it out just based on the cover. I think it’s a great effort, especially the back cover, but the name is a bit hard to make out since the “D” and the “Str” from Death Stranding are washed out because of the bright background. If the cover was just the words Death Stranding with the line stylization they’ve been doing with the logo, I think it would catch my eye. Also, it would be similar to the simple cover of the first Metal Gear Solid for PS1. Despite my little criticisms, it’s cool to see and would make for a great collector’s edition for when the game eventually releases. Death Stranding does not have an official release date but is set to launch on the PS4. There have been some predictions of when this game would be released thanks to a Twitter post from Troy Baker as well as a pre-order card from Best Buy. 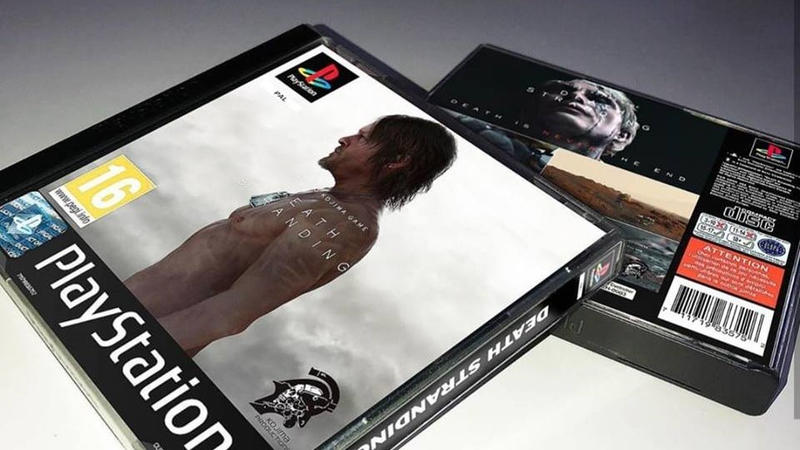 The post Death Stranding Looks Great in Throwback PlayStation Era Jewel Case by Michael Ruiz appeared first on DualShockers.